The very cool first-year-of-release UK Quad poster for. Don Siegel's classic 70s thriller. Starring Clint Eastwood in one of his most iconic roles. Any owner of this would feel like one lucky punk! Pinholes in top margin, one enlarged pinhole top right corner. Two inch long tears on right margin. Writing on back extremely light bleed-through. In fabulous original unrestored condition. 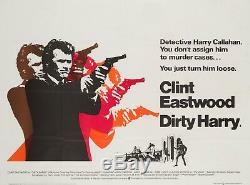 The item "Original Dirty Harry, UK Quad, Film/Movie Poster 1971, Clint Eastwood" is in sale since Wednesday, September 5, 2018. This item is in the category "DVDs, Films & TV\Film Memorabilia\Posters\Originals - UK Quads\1970s". The seller is "orsonandwelles" and is located in Bath. This item can be shipped worldwide.